Chicago Cubs pitcher Carlos Silva, battling a stomach flu, gave up four hits, struck out five and walked one in an easy 6-1 win over an impotent Pirates lineup this afternoon at PNC Park. The game was played in front of an estimated 3,000 fans who turned out for the highly-anticipated debut of new Pirate pitcher Dana Eveland (above), whom general manager Neal Huntington called a "probable upgrade" to the Pirates' current starting rotation. So what's that mean, he's probably better than Charlie Morton? That should generate some excitement. 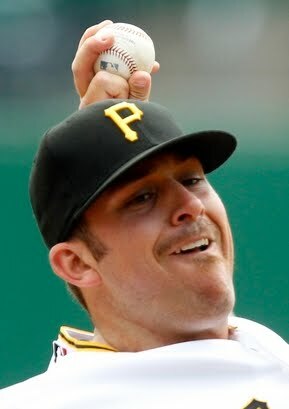 Eveland gave up six hits and three runs in his five innings of work, getting tagged with his first of many Pirate losses surely to come. But honestly, he had little to no chance to win with the lineup the Pirates threw out on Monday. Delwyn Young (.238) 3rd? Lastings Milledge (.246) 5th? We also got Bobby Crosby (.239) 6th, Jason Jaramillo (.195) 7th, and Ronny Cedeno (.240) 8th. I guess Jeff Clement was unavailable, because he would've been perfect in the clean-up spot. After seeing this motley crew of a batting order, no one should be surprised that the Pirates turned in six hits and one run on the afternoon. Thankfully, it should be an exciting 24 hours (by Pirate standards), as the draft takes place at 7 Eastern tonight and Strasburg Mania hits tomorrow at 7:05, with Jeff Karstens taking the hill for the Bucs. It would've been nice to see Brad Lincoln in that spot, but the Pirates probably didn't want to give us too much excitement in one week. That had to be the most boring game ever! I had enough when Greg Brown and Steve Blass started talking about Al Jolson. So what's the over/under on number of months until good old Jameson needs Tommy John's surgery? Better yet, how many months until we turn him into a hitter? I was down there again. There was so few fans there that they did not announce the paid attendance. I bet if Collective Soul was there, they woulda came in droves. I took the day off since it was my birthday, and took my son to the game. I was waiting for CYF to come and take him off of me for abuse of making him watch that game. Thankfully we have membership with the Science Center. On another point: I have been to games this year in Washington DC, Seattle, and Cleveland with work. NEVER have I seen the folks looking to squeeze every dime out of their customer. * Bought my 6 year old a hat since his old one was a big ragged. The cashier asked me "Why don't you buy two to match?" * "Photographers" trying to take pictures of every family, kid, etc in the stadium while the game is going on, then giving them a card of where to get the picture for purchase. Don't really have a problem with it if it's BETWEEN innings, but find it interesting I haven't seen this at other ballparks. Yes, I know it's my right to pay or don't pay for things, and don't have problem with plunking down my money when I'm in the ballpark. I just found this a different approach I haven't seen at other places I have gone to at MLB parks.